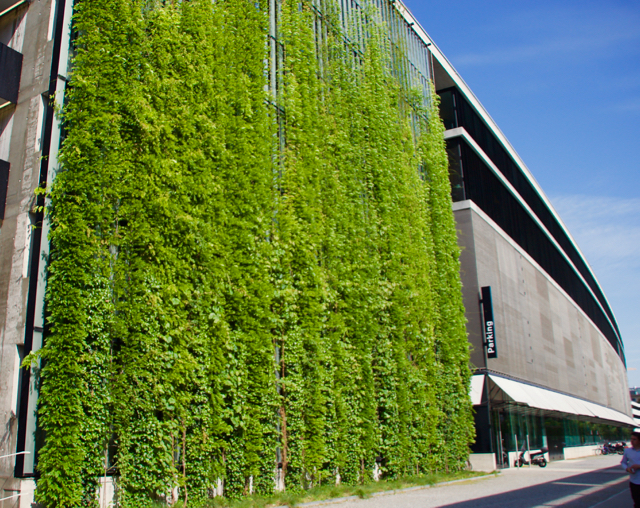 Green walls or living walls are part of Green Infrastructure in the urban realm when it comes to buildings. Climbers have been used as a self-regenerating cladding system for centuries. However, there are now modern techniques and processes that have taken the idea of planted walls to a whole new level. Modular systems are prevalent in the world of green architecture, and over the last 15 years have become reliable and useful approaches to greening buildings. The conventional approach to greening walls is through climbers. The most commonly used species are ivy (Hedera sp. ), Russian vine (Fallopia sp.) and Virginia creeper (Parthenocissus sp.). All three climb directly onto wall faces. This is especially true for walls made of porous brick and stone. These surfaces allow plants to attach themselves to the actual structure. The installation of trellises and wires on walls, however, can aid their growth. Furthermore, this approach can, to a certain extent, limit direct contact between the wall and plants. Establishing a dense evergreen foliage can be relatively quick. On many older buildings, this is actively managed to ensure that it does not obscure windows and other openings. Such dense foliage provides both foraging and nesting for a variety of birds and is of course of interest to invertebrates too. These plants however will usually be slower-growing and not as dense as conventional climbers. Many will have highly colourful flowers that can serve as nectar sources for insects, as well as providing a pleasant scent. It is often thought that these climbing plants can damage wall surfaces through their tendrils and feathered adventitious rootlets (in the case of ivy). In most cases, however, if the wall is solid and well-built there is no reason why damage should occur. Care should be taken, however, in respect of walls with cavities or with crumbling mortar in which roots could take hold and expand. 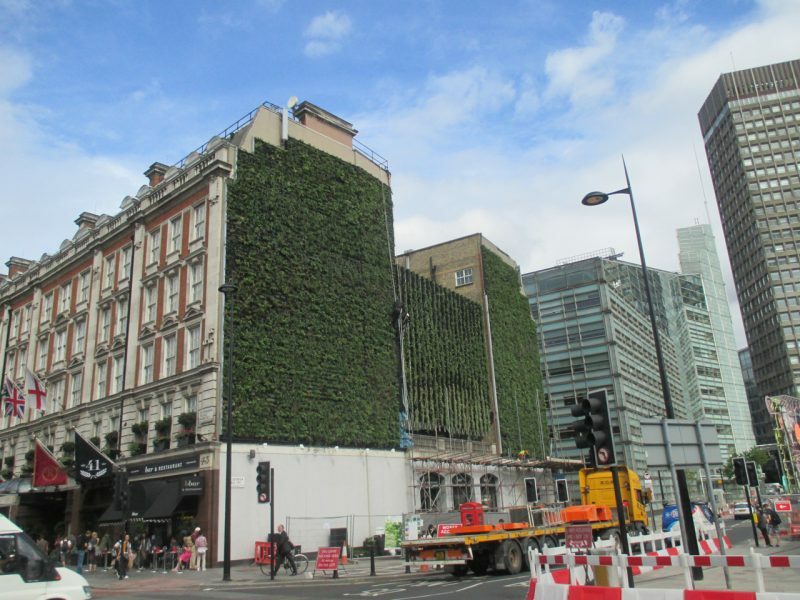 Over the last 15 years, there has been an innovative approach to greening walls through the use of modular systems. These use a wider range of plant species, to increase not only biodiversity but also the look of the facades. Modular systems are, on the whole, a high-tech solution and therefore tend to be a more expensive way to green walls. As with conventional living wall techniques though, such an approach can provide a wide range of benefits. Whether the modular systems are constructed of plastic, metal, rockwool or other material, plants are essentially planted into a growing medium held in the modules. They can use a variety of planting materials from sand to peat, coir to expanded clay pellets. This will all depend on the supplier of the system and the type of planting required. Most also come with an integrated irrigation system that also supplies nutrients. In the 21st century, our cities face many challenges, including overheating, air pollution, surface flooding and lack of biodiversity. With green space sometimes in short supply at ground level, greening the walls as well as the roofs of buildings can bring many benefits right to the urban core.